W520 displayport output into an old tube tv via RCA A/V input? I have a question that's probably more appropriate (or was already outdated) for 2011... I have a W520, and I'd like to see if it's possible to take the signal from the displayport and send it onto an older tube style tv that only has the RCA red/yellow/white inputs for audio/video. I've used a displayport to hdmi adapter to send the displayport signal to a modern tv and it worked great to watch shows streaming from online. I now want to get some online shows at my parent's house for them to watch, but they only have an analog, circa 2002 tube tv in the house, with the standard 4:3 screen, and I guess 720x480 resolution. Has anyone ever tried connecting the displayport output to an old analog tv set? Since I know there are displayport to hdmi adapters, and there are hdmi to RCA A/V adapters out there, does anyone know what happens if you daisy-chain them together out of a Lenovo displayport? Just trying to find out before buying the adapters. Also, will it auto-downgrade the display resolution to show correctly on the tv? And/or will it mess up the desktop icon layout on the laptop if it auto-reduces the laptop resolution at the same time? Re: W520 displayport output into an old tube tv via RCA A/V input? Rather than buying them possibly and most likely non-working cable-concoctions, why not spend a few dollars more and get them a more modern flatscreen TV with HDMI? Or have them watch those program ON that W520? Skip the RCA to coax and this video should help you. It's a logistical challenge since they have a giant '90s wood entertainment center (with the stereo cabinet, dvd player, cabinets, drawers, etc etc) that they don't want to get rid of, and that only has a square opening for a max 27" tube tv. Putting in a 16:9 flatscreen to fit the max width available would be such a tiny view area. I tried the laptop directly but it's also kind of a pain. Might want to consider using the VGA output. VGA to RCA may be easier. Then again, maybe not. Despite modern software that simulates the look of a CRT with scanlines etc, I still find that the real thing is more convincing. I'm mainly referring to retro gaming software. they have a giant '90s wood entertainment center (with the stereo cabinet, dvd player, cabinets, drawers, etc etc) that they don't want to get rid of, and that only has a square opening for a max 27" tube tv. Putting in a 16:9 flatscreen to fit the max width available would be such a tiny view area. I had the same problem when I moved into my current home inheriting the previous tenant's furniture. I liked the rest of the entertainment center and so I kept it, but was stuck with a tall but narrow hole originally designed for 4:3 TVs. 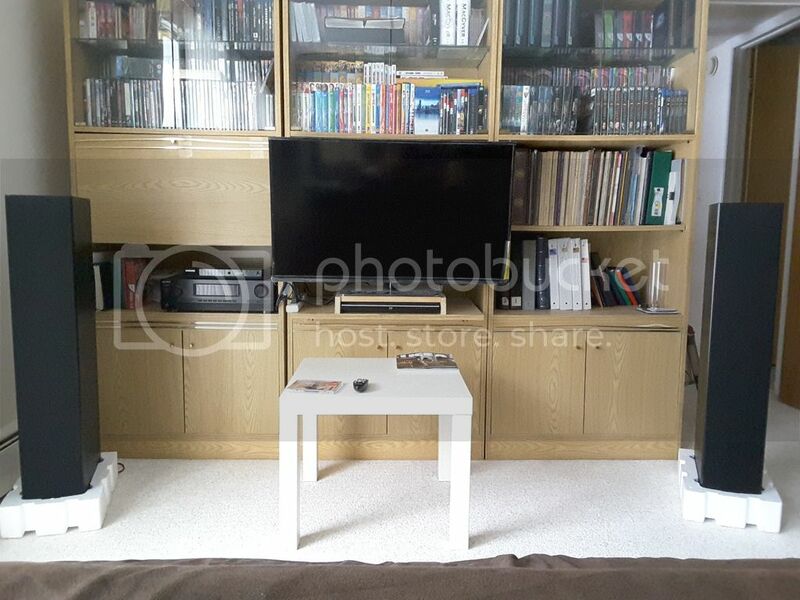 My solution was to put the 16:9 LCD TV in front of the hole, as you can see in this photo: http://i198.photobucket.com/albums/aa13 ... 6prcym.jpg . To do this you may have to fabricate an extra platform. Thanks for sharing the photo of your solution. Unfortunately that won't quite work in our situation since the cabinet immediately adjacent to the tv hole has a glass door that would get blocked by a tv placed like that. Looks to work well in your case though. What's the width of the opening? Let me look around for HDTVs with super slim bezels, to maximize the screen size that fits. Last edited by PeterNC on Tue Jan 08, 2019 10:02 am, edited 1 time in total. A W520 is an HDMI-capable notebook, since it has DisplayPort++ which can output native HDMI via a passive adapter. Last edited by PeterNC on Tue Jan 08, 2019 10:02 am, edited 2 times in total. I guess by the sound of it no one has tried the exact setup I'm looking for, but I suppose I'll just give it a try and buy the 2 adapters needed for displayport=>HDMI=>RCA and see what happens. I can note the results here later for anyone's future reference. Before buying the adapters, which may not work, keep in mind that LED TVs typically consume much less power than CRT TVs: for example check this site. In the long term you would save money by getting an LED TV, versus buying the adapters and continuing to use the CRT TV. The LED TV would also double as a computer monitor. As I suggested earlier, you can maximize screen size by finding an LED TV with the smallest bezel, possibly 24"; measure the furniture before buying. While old 4:3 TV shows would of course look bigger on the CRT TV, widescreen movies and TV shows would look slightly bigger on a 24" 16:9 TV. If you can wait for about a month, you might get a 24" LED TV for dirt cheap around Black Friday and Cyber Monday. Last edited by pianowizard on Mon Oct 22, 2018 12:24 pm, edited 1 time in total. Not sure if his parents want some random 24" TV laying around, and if he trying to save electricity, well he likely wouldn't have even considered the CRT. Putting in a 16:9 flatscreen to fit the max width available would be such a tiny view area.